The leader of the Iowa National Guard has announced plans to retire on May 1st. Major General Tim Orr was appointed to the job by then Governor Chet Culver in March of 2009. “I’ve been serving for 40 years in the Iowa National Guard and 10 years as the Adjutant General. You reach a point where it is time for the organization to move to the next chapter — and for me to move to other opportunities that are out there,” Orr told Radio Iowa. The 57-year-old Orr joined the Iowa National Guard in 1978 after graduating from Boone High School. He wasn’t thinking then about moving from being an enlisted man to wearing stars on his shoulders. “I was looking near term, I was going to go to college to be a school teacher, which I did become and taught for a while. So, I was a part-time guard soldier serving in both capacities as a civilian and the military. I never though to be honest with you that I would get to a colonel’s rank,” Orr says. Orr rose to the rank of staff sergeant and then decided to stay in the guard and become an officer. The top job still wasn’t something he considered. Orr says he got a lot of support from those around him and that allowed him to continue moving up the ranks. His tenure included a time where the guard continued to take more of an active role in the military conflicts around the world. That included the state’s largest federal mobilization since World War Two in 2009-2010 when the 2nd Brigade Combat Team, 34th Infantry Division, deployed 2,800 Soldiers to Afghanistan. 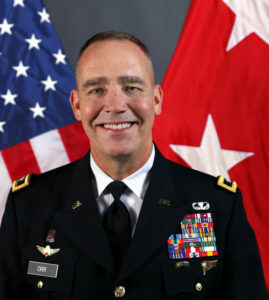 Among his other accomplishments: Orr started the State Partnership Program between the Iowa National Guard and the Kosovo Security Force, which led to the establishment of the first foreign consulate in Iowa, youth and college exchanges and numerous sister state and sister city relationships in communities across the state. Orr also came up with the Home Base Iowa program to attract high quality veterans and their families to the state to continue their military service in the National Guard and help fill critical labor shortages at Iowa based employers. He sold that program to former Governor Terry Branstad. Orr says he is leaving the Iowa National Guard in good shape. He says the recruitment of new members is near 100 percent of its goal. “I think we have a great product and a great message to sell to our young people. You know, there’s money for school, there’s money for benefits, opportunity and a chance to make a difference,” according to Orr. Orr’s wife Suzanne retired from the Iowan National Guard after 27 years, and he has one child attending the University of Iowa and one who is at the U.S. Air Force Academy. Orr says he looks forward to spending more time with his family in retirement, running triathlons, doing some fishing and relaxing in a non-military setting before moving on to some new opportunity. Brigadier General Stephen Osborn, the current director of the Iowa National Guard Joint Staff, will serve as the interim adjutant general.